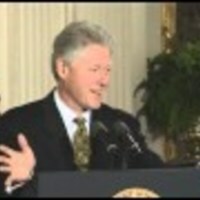 This is video footage of President Clinton delivering remarks to the Northern Ireland Assembly. This footage is official public record produced by the White House Television (WHTV) crew, provided by the Clinton Presidential Library. This material is public domain, as it is a work prepared by an officer or employee of the U.S. Government as part of that person's official duties. Any usage must receive the credit "Courtesy; William J. Clinton Presidential Library," and no exclusive rights or permissions are granted for usage. 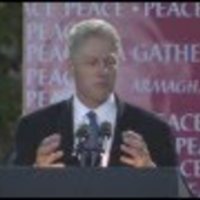 This is video footage of President Clinton delivering remarks to the community of Armagh. This footage is official public record produced by the White House Television (WHTV) crew, provided by the Clinton Presidential Library. 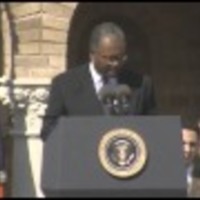 This is video footage of President William Jefferson delivering remarks at a Christmas tree lighting ceremony. This footage is official public record produced by the White House Television (WHTV) crew, provided by the Clinton Presidential Library. 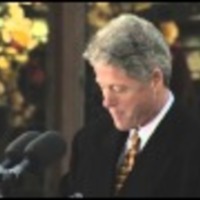 This is video footage of President Clinton delivering remarks to the community of Londonderry. This footage is official public record produced by the White House Television (WHTV) crew, provided by the Clinton Presidential Library. 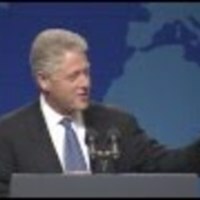 This is video footage of President Clinton delivering remarks at the Mackie plant in Northern Ireland. This footage is official public record produced by the White House Television (WHTV) crew, provided by the Clinton Presidential Library. NOTE: Tape #s 04588 & 04590 have considerable noise damage on the footage that cannot be rectified. 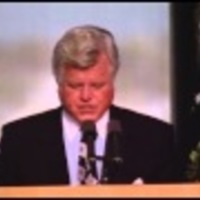 This is video footage of President Clinton delivering remarks at the dedication of the John F. Kennedy Presidential Library. This footage is official public record produced by the White House Television (WHTV) crew, provided by the Clinton Presidential Library. 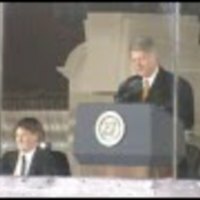 This is video footage of President William Jefferson Clinton presenting the Congressional Gold Medal to the "Little Rock Nine." This footage is official public record produced by the White House Television (WHTV) crew, provided by the Clinton Presidential Library. 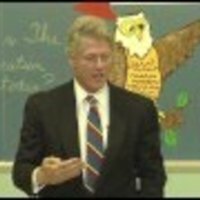 This is video footage of President Clinton speaking at a Q & A session with students regarding the Brown V. Board of Education decision. This day marked the 40th anniversary of the decision of Brown V. Board of Education, which declared the establishment of segregated public schools for black and white students was unconstitutional. This footage is official public record produced by the White House Television (WHTV) crew, provided by the Clinton Presidential Library. 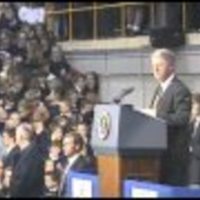 This is video footage of President William Jefferson Clinton delivering remarks at the 40th Anniversary of desegregation of Little Rock Central High School. This footage is official public record produced by the White House Television (WHTV) crew, provided by the Clinton Presidential Library.